This will mark a first in our lives. Close to 2 pm, e.s.t. 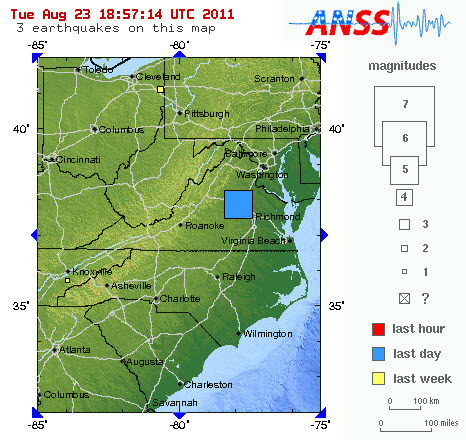 a 5.9 earthquake shook a wide area on the east coast up to Maine or even Canada. It originated in Louisa, Virginia. Sean and I were standing near the dining room table and the china closet and chandelier started to rattle. Brian was home for lunch and sitting in the lounge chair and he felt it moving! It may have lasted up to 30 seconds. I thought a tree had fallen down out back! I called the neighbor and she felt it too. All we had to do was turn on the tv and we saw how widepread it was then! We were on our way out to West Chester U. where Sean needed to get his I.D. before his classes start next week. We sat for a while, called the college and they said things were calmed down. We did decide to ‘roll’ there and Sean got his I.D. and we walked around the campus which brought back memories for me as I went there back in 1981-1982! : ) We then went by my late Uncle Don’s house which was sold a few weeks ago. There’s a dumpster in the driveway and many bushes have been trimmed. I helped clean up his yard (with either Brian or Sean) a few times. It made us feel bad, but life does go on. We also got a little shopping in. 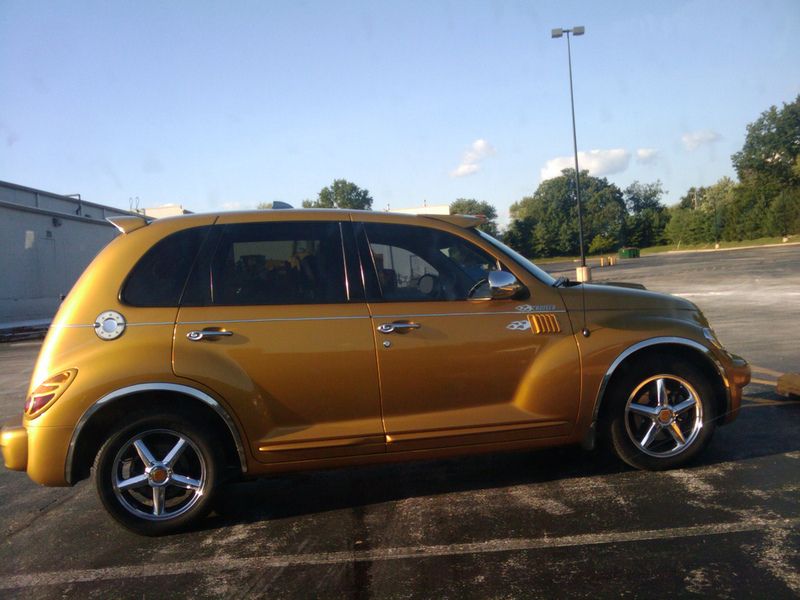 I saw a PT Cruiser just like mine-same gold, but very customized with lots of chrome. I did take a photo. This is only the second gold one I’ve seen since I bought mine. They are certainly loved and enjoyed. So things are good, I thank goodness the tremor wasn’t stronger. What an experience. So you did feel it! I thought you probably did. I have never seen a gold PTC, until you got one. I certainly did feel it too! I was lying down on my bed to watch something on tv when all of a sudden the whole bed was moving back and forth. It seemed to last so long!! It actually made me feel a bit dizzy!! I turned the radio on right away and they were saying that it was a tremor from an earthquake on the east coast of the US. Scary stuff! How neat to see another PTC the same colour as yours:-) It’s gorgeous! !